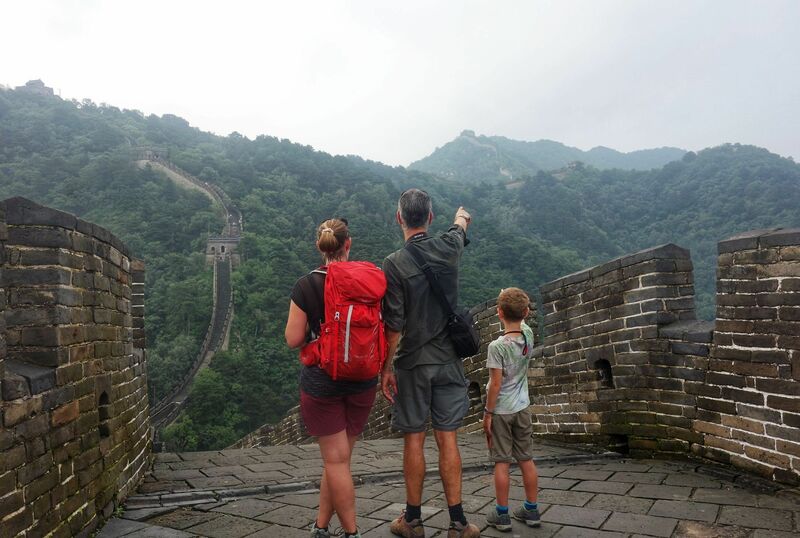 We spent 7 weeks travelling through China. When we first started it felt like it was going to take forever. But actually it passed really quickly. We travelled in Summertime, which was a bad idea as it was too hot and too busy! 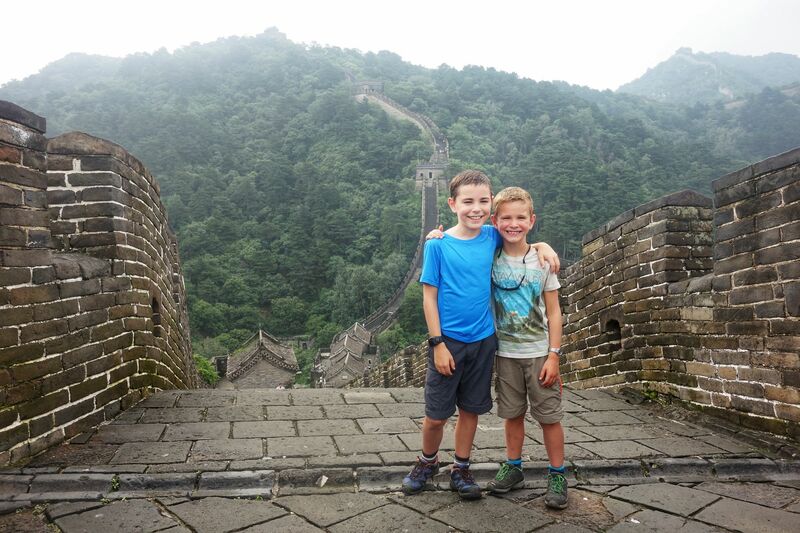 But we still enjoyed it as much as we could and loved our time in China! The first stop on the way was China’s capital city Beijing. We arrived at midnight exhausted after being on 2 five hour planes (one being a A380) and passing through lots of time zones. We got a taxi to are hotel and went to sleep. The next day we got up and went to find our next hostel and rested there for the rest of the day. Next of on the list was the Forbidden city! but the thing we didn’t know was how humid it could get, it was 38 degrees, but felt much higher! We then made are way back and started to search for somewhere to eat eventually we decided on this noodle place that only did beef and it was awesome. The next day was another big one because we were going to the great wall of China. 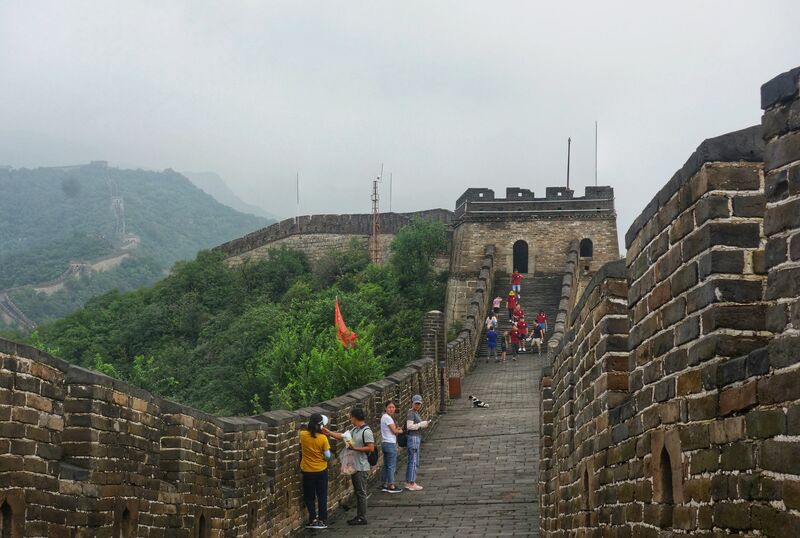 We got in a car at 6am and had an hour and a half drive and arrived at the Great wall of China, Mutinayu, entrance. It was very quiet, which was unusual for China. 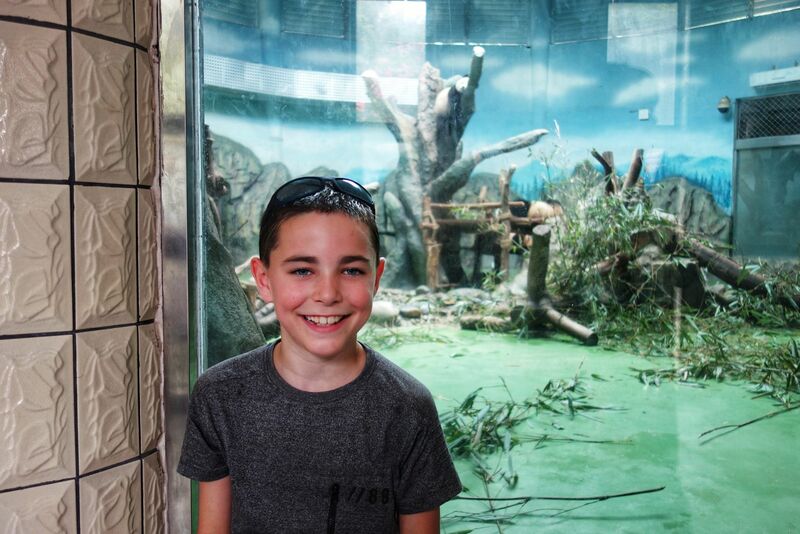 We travelled on the shuttle bus to the main entrance and climbed one of the walks to Tower 6. The walk was tough, but not impossible. The views off the wall were astonishing. We were right over the city on one side and the other was the beautiful Chinese countryside. We started to make our way to Tower 1, but all the way it was ups and downs. 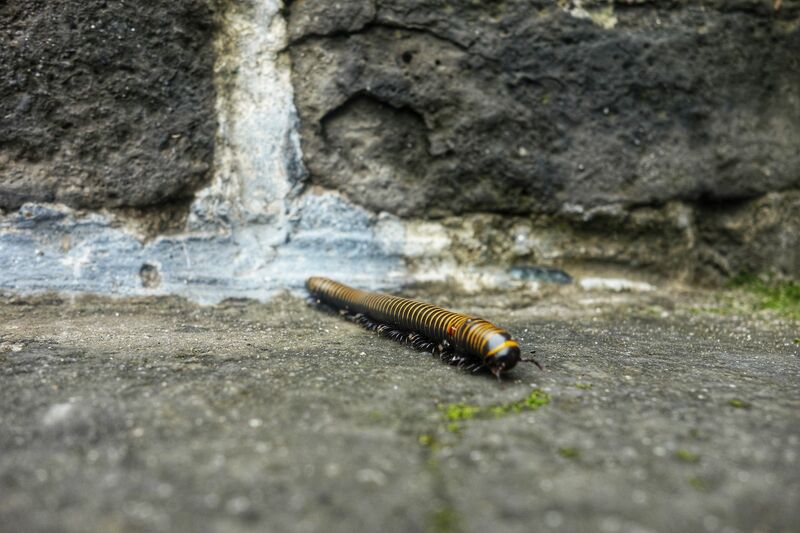 We even saw a few bright yellow and black centipedes. We walked up ladders, through battlements, passages and lots more. 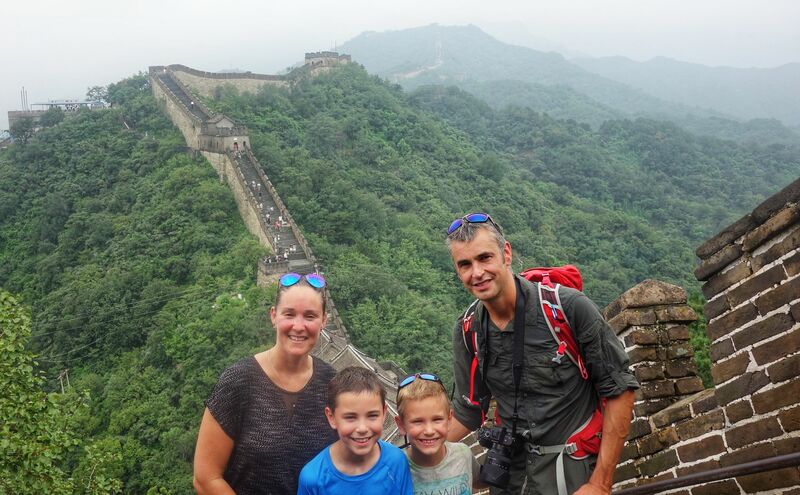 Once we had made our way to Tower 1 we had a pit-stop to admire the view and it was unbelievable. After our stop we started to make our way back towards Tower 10 where we met another path and strolled down. When we got down the queues were really long. I felt ecstatic that I’d just climbed one of the 7 wonders of the world. Everyone’s legs were wobbling, except mine! Shows who’s the strongest! One afternoon we went out to see the Science museum and to see the Olympic Park. The science museum wasn’t really that good and the queues were giant. We didn’t stop for long and eventually we got shooed out by the security guards because it was closing. All the escalators which switched to down and the guards were all shouting and blowing whistles – it was quite funny! After the Science museum we started to walk towards the olympic park. We were getting hungry so we went into the shopping centre and had our first dumplings. Dad’s kinda addicted to them now. 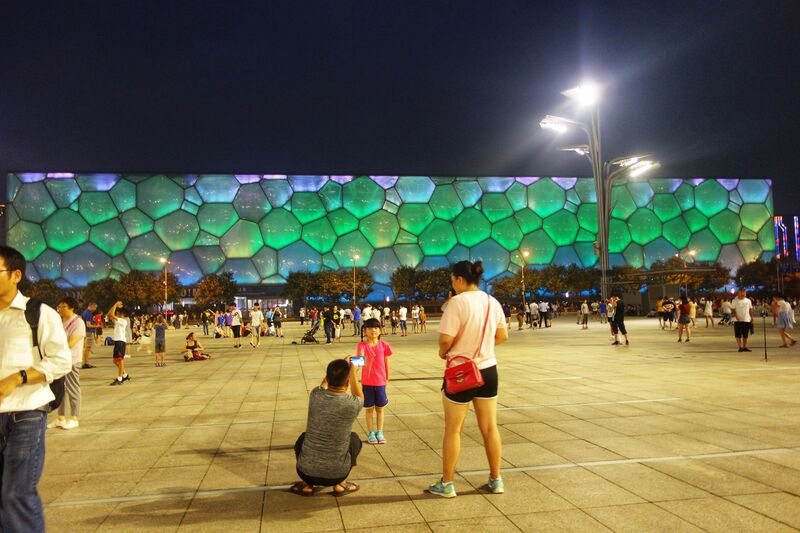 After we’d eaten we walked over to the birds nest and Water cube. Jasper and I started running and jumping around and generally going crazy while we waited for the lights. At 8pm all of a sudden all the lights just flickered on. 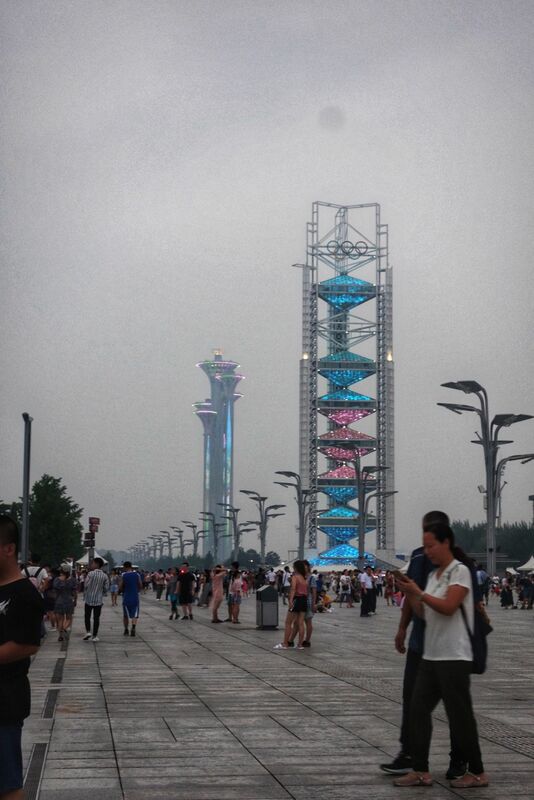 The best lights were the Birds Nest, Water Cube and the Olympic torch towers. While we were waiting, we were mobbed by tourists wanting to get a picture with us. I felt like a celebrity and I liked it for a while, but soon it got old! 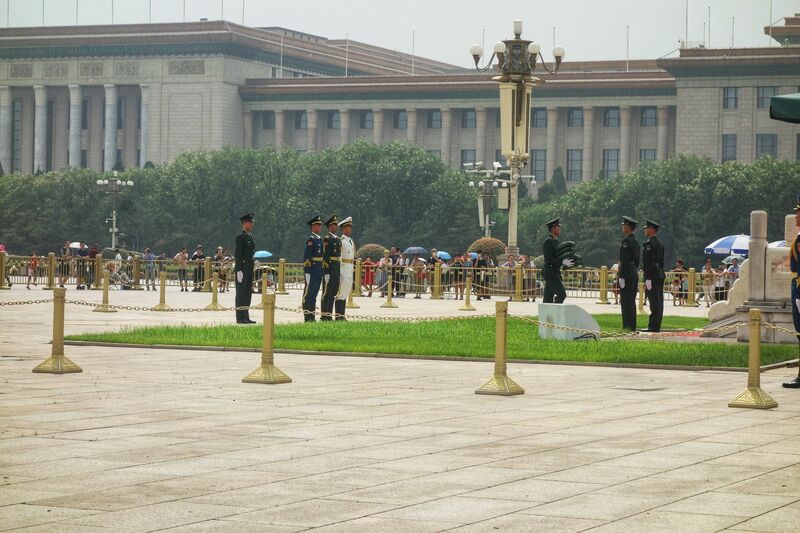 The day after, we decided to go to Tiananmen Square the largest square in the world. As I said before we had no clue how hot it could get, so we walked into the square and it was frying us alive. After we got over the heat we watched the soldiers swap positions and then went back to are hostel. Before Xian we went to Pingyao which is were the Kung Fu Panda movies were baced on. We got there on are first train, in Pingyao we climbed the city walls. then after about 3-4 days in Pingyao we got on a train and set of towards Xian. Before we could do anything we had to find are hostel. After the train journey we got on the metro. Once we finished with the metro walked down a lot of small alleyways and along the way you could see boxes full of crickets which made a racket and we even saw butcher cutting up the different meats. All in all it was great, I felt so alive. Eventually we got to are hostel and settled down for the night. ]I woke up feeling very excited. 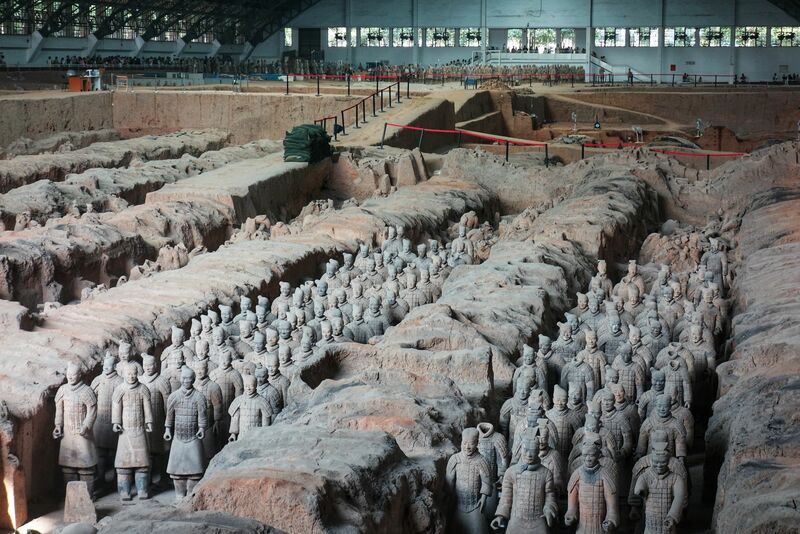 We were going to the Terracotta Army today and I’ve heard it’s one of the best discoveries in recent years. We got a local bus to the bus station, and transferred onto a tourist bus to go to the Terracotta Army. We bought some tickets and set off towards the warriors. We decided to go to Pit 1 first, as it’s the biggest pit of all. As we walked in it was so, so busy. It was impossible to get the front but I managed to squeeze my way through. And then I saw it! There was rows and rows of soldiers, cavalry, horses all facing different directions to protect their king. It was tremendous! We learnt that majority of the soldiers were facing forwards, while guards on either side were protecting the flanks. We made our way down the walkways and saw a chariot and a tomb. 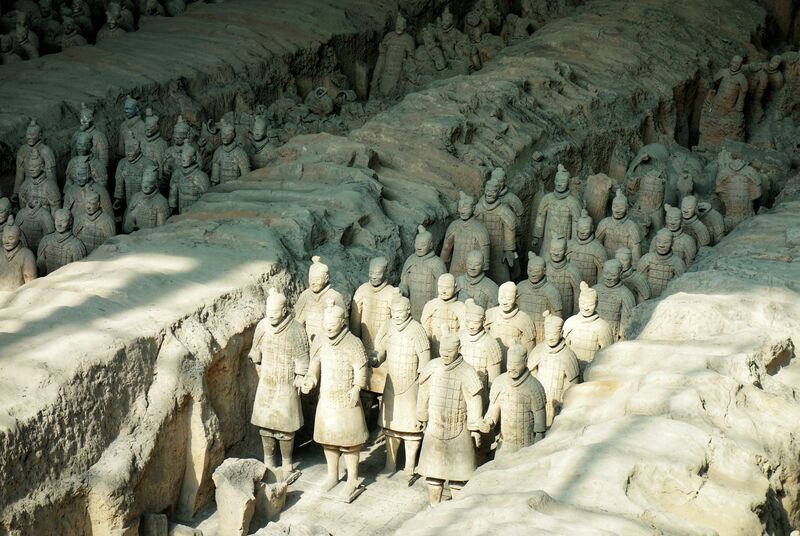 The Terracotta Warriors were constructed by Qin Shi Huang. It was said that each warrior was once a real soldier from the original army. We also saw broken soldiers being pieced together with sticky tape and they looked like zombie warriors! We then went to Pit 2 where we saw most of the archers and chariots. This was where we also saw the method of how they preserved all the soldiers. As it turns out they put wooden planks above the soldiers heads and covered it with mud and clay. 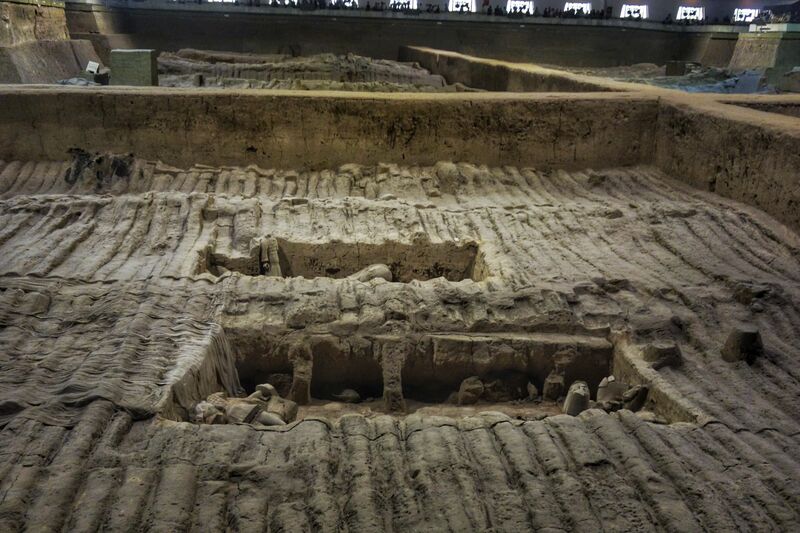 In Pit 3 there were nowhere near as Pit 1 and was still being excavated as the Terracotta warriors were only discovered in 1976. 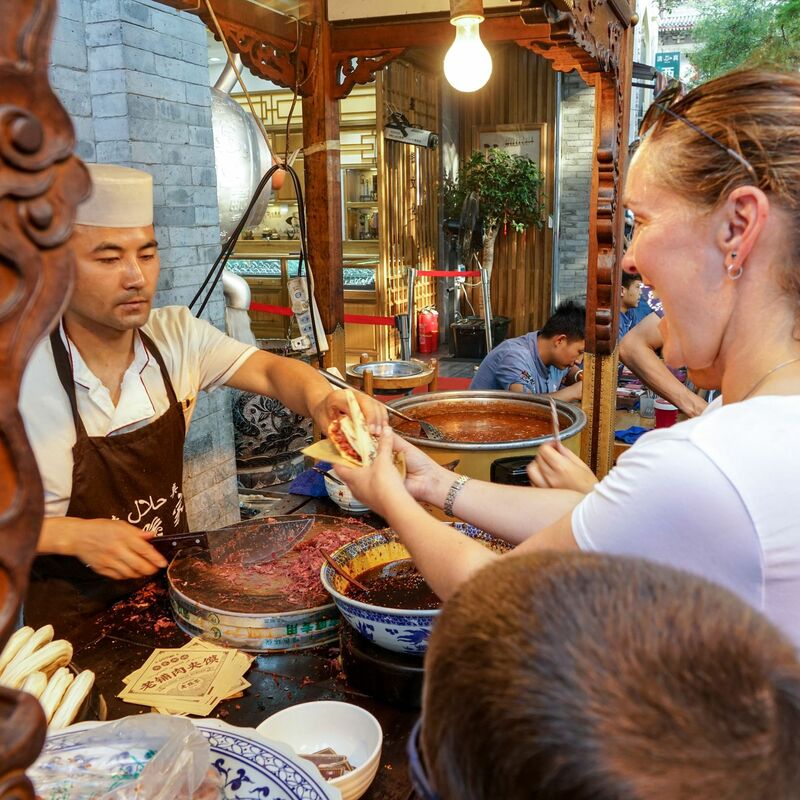 That evening we went down to Muslim street and saw lots of different foods along the way, such as Cuttlefish on sticks, crisps on sticks and chinese hamburgers. When we venured down we saw one particular place which had a giant queue for the chinese hamburgers. So we thought that if everyone else liked it that we would like it to! Mum waited in line while we walked down the street seeing butchers cutting meat up, people doing silly dances and generally alot of people. We watched how he made the hamburgers and it was lightening fast. It took about 4 seconds for him to cut up the meat, slice open the bun and stuff it with braised beef. We all tried some, but I didn’t really like it but dad seemed to enjoy it alot. We started to look for somewhere to have dinner, so we wandered down the street and found a restaurant. We ordered quite a few things we liked. We ordered some sweet and sour crispy pork and it was delicious! The next day we decided to go to the Bell and Drum towers so we got up and went out to explore. We almost got lost the second we got out of the door. 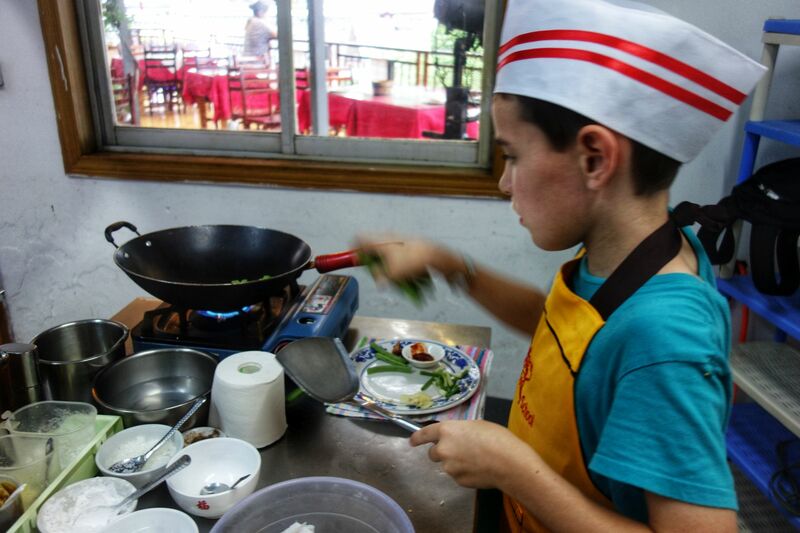 There was so many different herbs and spices like cumin and coriander and it was so enticing but we made it. Unfortunately I lost my sunglasses in Beijing so we had our hopes up to find some in Xian. We stumbled across a side street which was selling lots of different things (including sunglasses!). Dad started haggling until eventually he came across someone who was willing to accept the price that dad had put down. It was very good to watch! Mum arranged to meet with another travelling family, so we went down to the Drum Tower to meet them. Their names were Braxton, Lincoln (kids), Logan and Paula (parents). We took them down Muslim Street and back to the same restaurant, as it was so nice. We sat with the boys and had a delicious dinner. It was such a lovely evening and they were so nice. 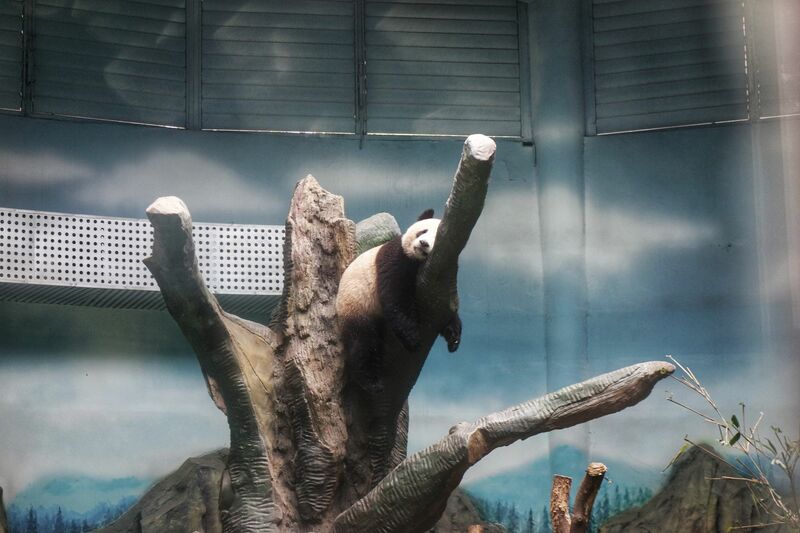 After Xian we visited the Giant Pandas at Chengdu. 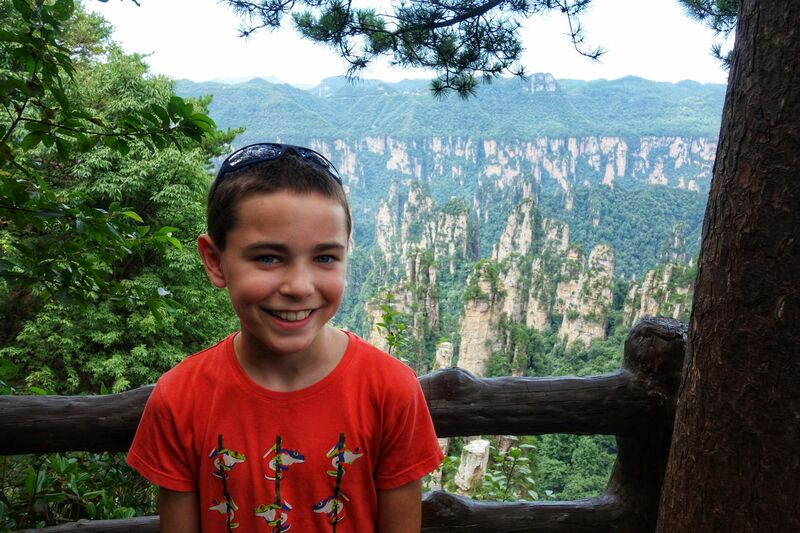 Then we caught our first sleeper train to Zhangiajie to see the avatar mountains and explore the national park. 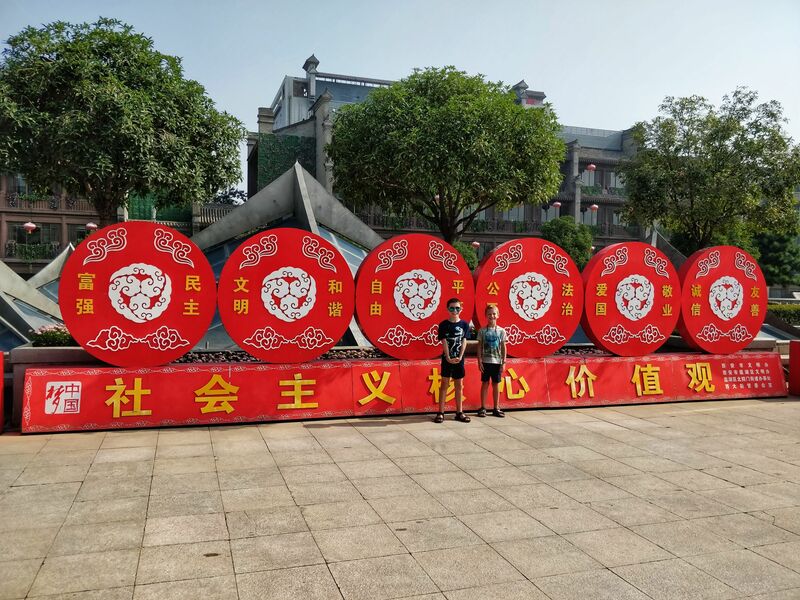 We went to Shanghai for a couple of days before visiting the small watertown of Zhouzhuang, then onto Hangzhou and Huangshan where we just chilled out a little. Finally we reached Guillin. 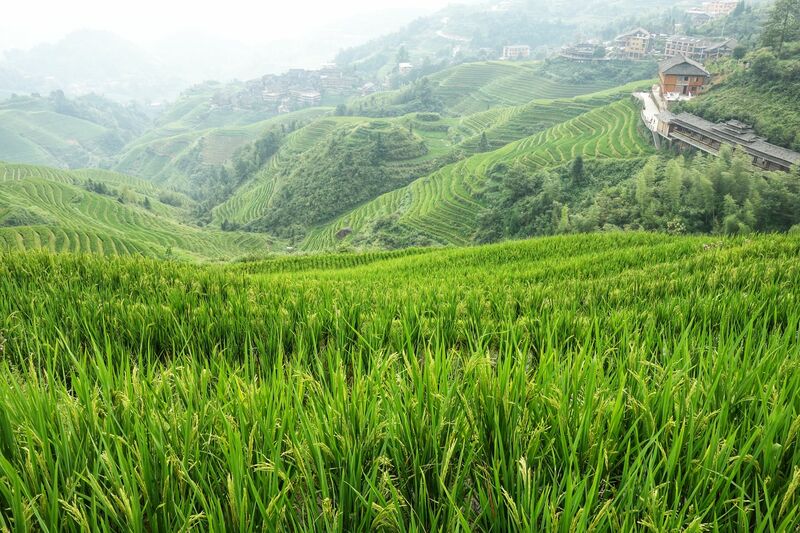 While we were in Guilin we decided to go to Llongji Rice Terraces. We got a 3 hour bus to the area and then had to walk for about an hour just to find out hostel. We were given instructions, but they were so complicated! We even found a few other people who were also going to our hostel and were lost! The views from our hostel were just beyond words. And everyone told to just stay for 1 day, but we wished we’d stayed for longer for the amazing views and the peacefulness. The first evening I walked with dad up to the Golden Buddha. Jasper and mum were too tired so went back. 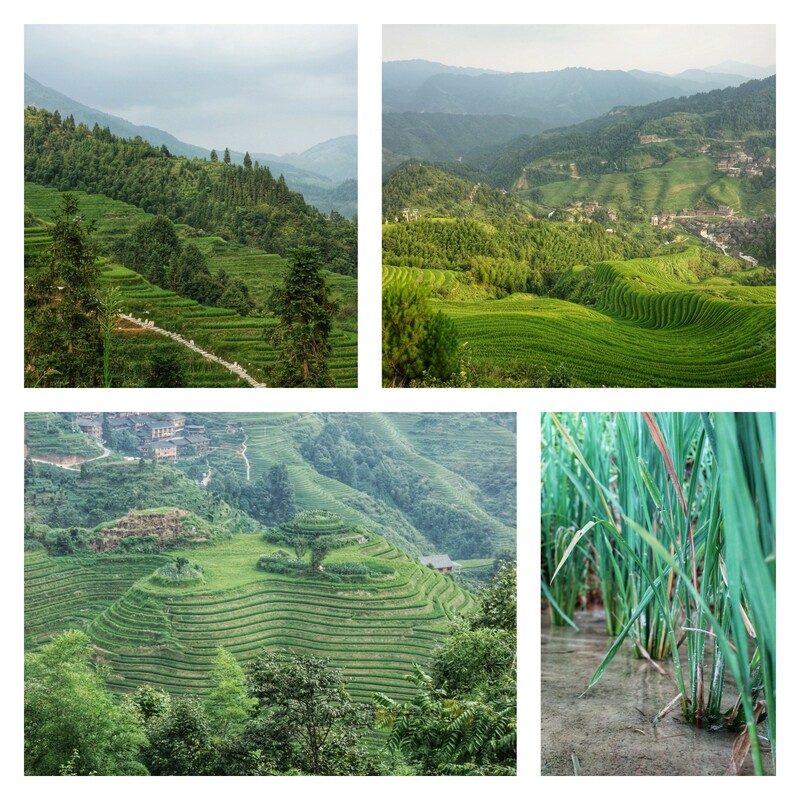 We took some phenomenal sunset pictures across to the rice terraces. The next day we got up and explored the other two viewing points which were a Thousand layers and Music from Paradise. All of which were unbelievable! At the hostel we made some friends and played table football and chinese poker. It was great fun. 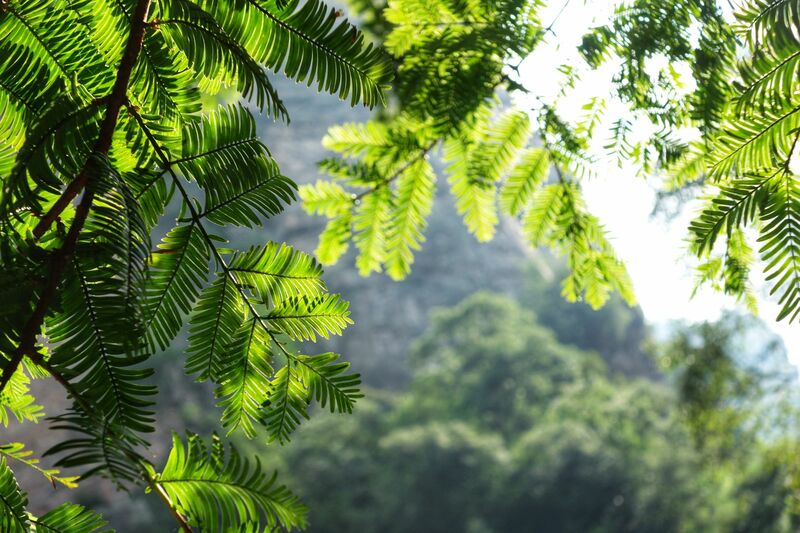 The next day we went back to Guilin. 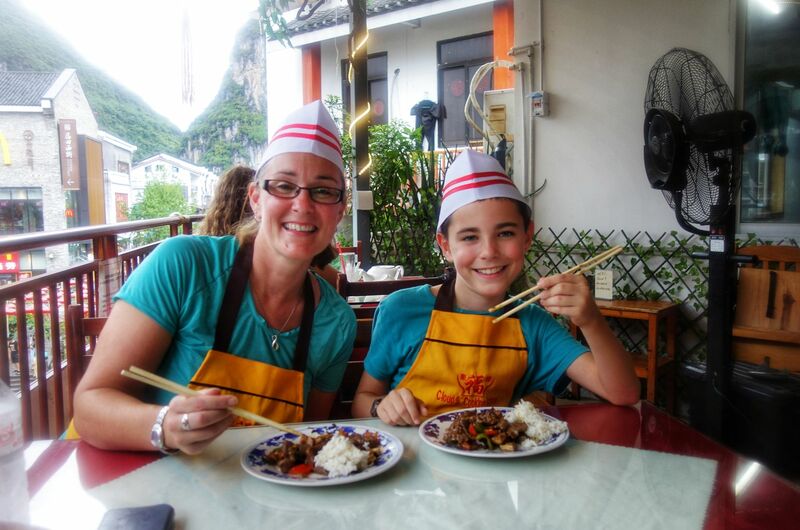 After we stopped for another night in Guilin we travelled to Yangshuo. We spent a week here and while there we hired bicycles, a scooter, visited the mud caves and mum and I went to Cloud 9 cooking school. As part of the cooking school we went to the local farmers market, which had everything jumbo sized. From frogs to dried squid and even giant cucumbers. 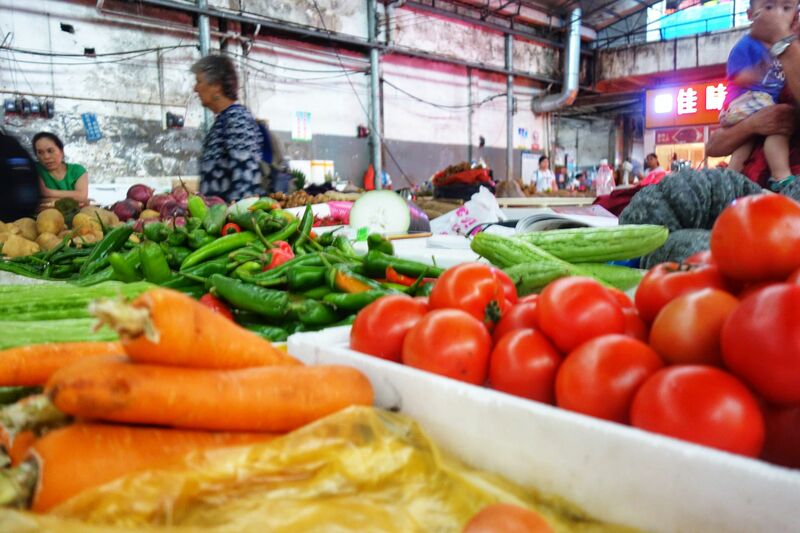 There was two different markets, one for vegetables and one for meat – where we saw dogs and cats – yuk! After Yangshuo we had to cross the border by train into Hong Kong. We stayed at a hostel on Hong Kong Island. Hong Kong was crazy, but in a good way. Everything was so compact and there was no space at all. The only way they could keep building was to keep going up and up and up! 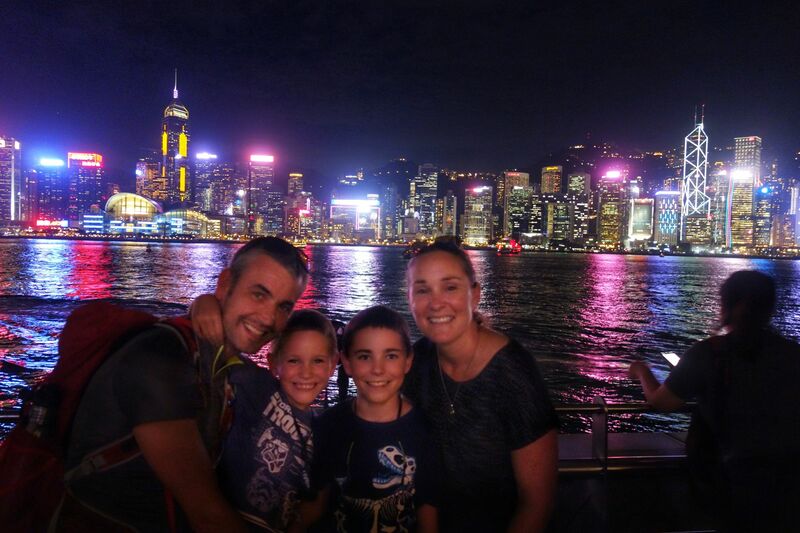 In Hong Kong we watched a light show which was o.k. but the real cool thing was the actual city! 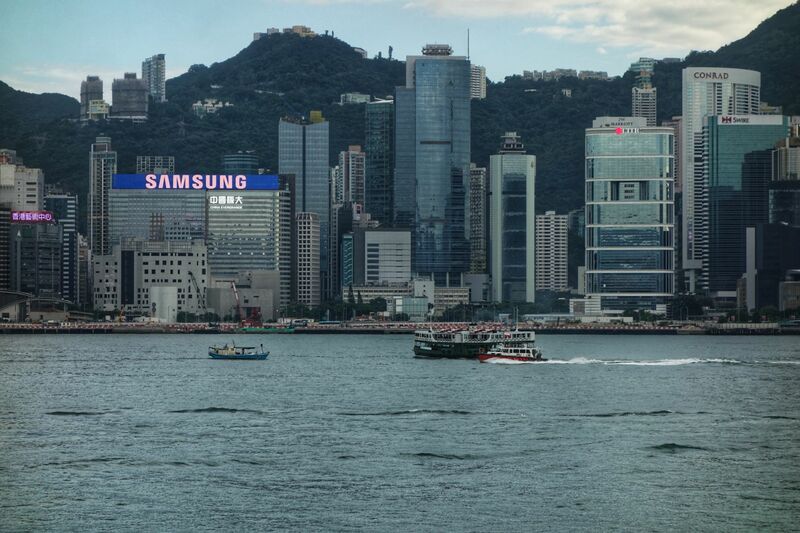 We got the star ferry back to Hong Kong Island. We visited one of the beaches on Hong Kong Island, Deep water bay. It was great fun as we haven’t been in the sea since Croatia! I saw with dad out to the three rafts in the bay, it was awesome – I miss swimming! 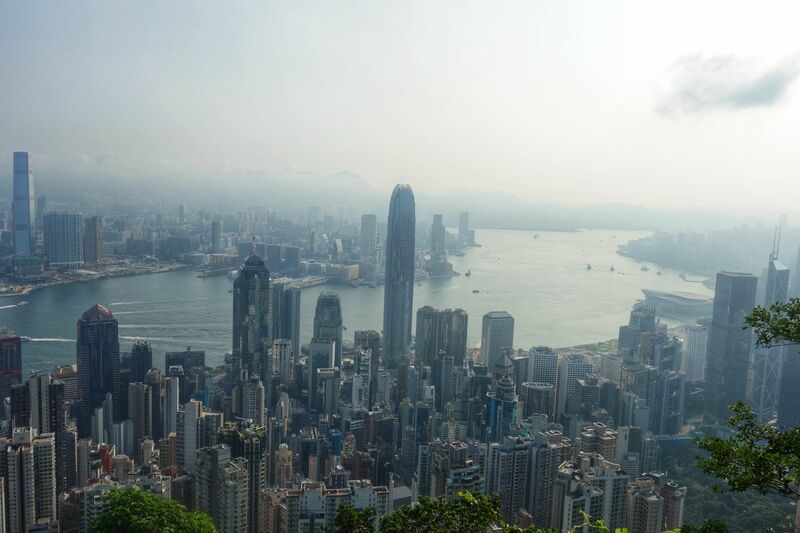 We got up early one morning and got a tram to the top of Victoria Peak and went for a walk around the top. We saw some amazing views over Hong Kong. There were lots and lots and lots of shops in Hong Kong and it was hard to find pretty much anything because everything was right above you. But on the plus side there was a McDonalds and Starbucks on every corner! 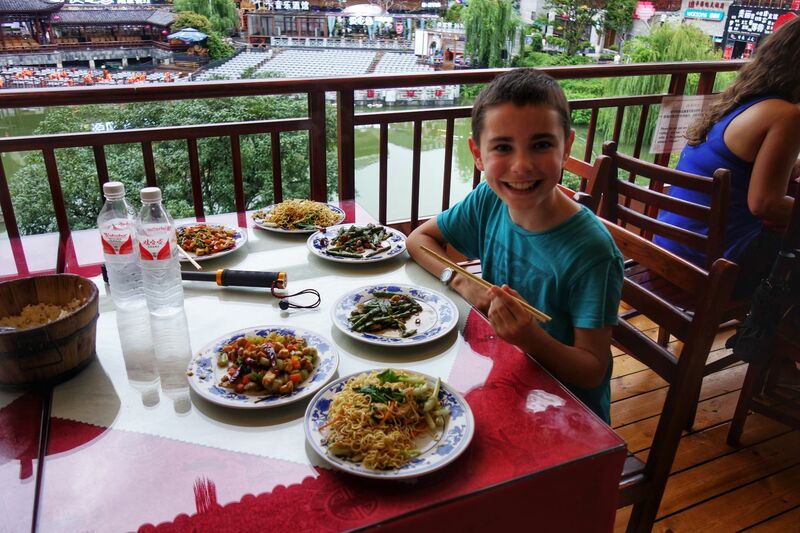 Thank you for reading my blog about travelling in China! Thanks grandma. Miss you lots. Thank you I’m really enjoying taking photos. 5C just wanted to say hello! We have been reading your blogs – there are lots of ‘oohs’ and ‘wows’ when they see your photographs. Keep up the superb work!